Millions of people around the world utilize cars for their daily lifestyle. Your car gets up to and from work, allows you to drop the kids off at soccer practice and take family vacations. Meanwhile, hundreds or even thousands of car manufacturing companies are releasing newer and better versions of these sedans nearly every week. With millions of vehicles on the market, one may think that the wide collection of cars have nothing more to offer when it comes to design as there are thousands of drivers who have the same exact vehicle on their garage. However, there are certain high-profile cars that can be considered invaluable due to their rising popularity, regardless of their ordinary make or model. These kinds of cars take driving from merely a chore to a luxury. So how did these cars become famous? Simply put, these high-profile cars have achieved their popularity due to their role or part in blockbuster films or movies. Whether they’ve been driven by the bad guys or the good guys, the following 3 cars have been well recognized by people all over the world because of simply performing and driving on screen. 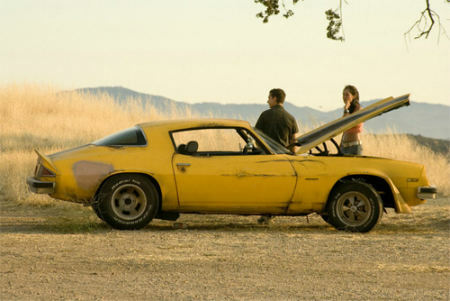 1.The 1976 Chevy Camaro from the 2007 hit movie Transformers. Who doesn’t recognize the solid yellow with two black stripes on the hood of this sedan? Playing as the first version of Bumblebee until he decided to transform in a classier and brand new Camaro, the 1976 Chevy Camaro was the top choice of film directors. Sure you think the car is trashy and a running scrap metal, however, this is how the directors really intended Bumblebee to look during his first appearance in the movie. The producers of the movie even asked help from GM managers to assist them in choosing the crappiest looking Camaro they could find. The Aston Martin DB5 that was used several times from the series of James Bond movies, such as Casino Royale and Goldfinger. All the elements of the movie are powerful and sleek from the lead actor to the story line to the stunts and action scenes. It would be a shame if the vehicle that Bond was riding was a piece of scrap metal, right? The Aston Martin DB5 is the perfect match for this dynamic and elegant film with ZF five-speed transmission and a 4.0-liter aluminum engine that can go top speeds of up to 145 miles per hour and can reach acceleration speeds from zero to sixty in a matter of 7.1 seconds. Only two of these vehicles that were originally driven by Sean Connery in the movie remain. One was bought for a whopping $4.1 million during a 2012 auction. Known as the time machine which Doc Brown and Marty McFly drove to go back in time, the DeLorean DMC12 featured the Gull Wing style doors and a fiberglass body type. This particular type and model of vehicle was produced during 1982 with only 9,000 units made. 6,500 units are still believed to be used. Other vehicles that have achieved popularity include the 1967 Shelby Mustang GT500 from the movie Gone in 60 Seconds and the 1977 Pontiac Trans AM from the 1977 film Smokey and the Bandit. Sam is a car and motorcycle enthusiast who grew up riding a Harley Davidson with her dad and had a fascination for motorcycle accessories. She is also amused by any type of movie featuring fast cars, bad boys and the open road. My choice is Mitsubishi. Nice car. Dependable and good working machine. World is changing day by day and car and its changing is very fast as a revelation.